In 2005, CENIBRA was granted both the FSC® (Forest Stewardship Council®) and CERFLOR (Certificação Florestal – Forest Certification) certificates for its Forest Stewardship System and the pulp Chain of Custody, with each certification has its principles and criteria. The CERFLOR certificate is a Brazilian forest certification initiative, whose standards were prepared by ABNT (Brazilian Technical Standards Association). The Forest Stewardship Certificate is managed by INMETRO (Brazil’s National Metrology Institute), which is in charge of accrediting the certifying institutions as well. 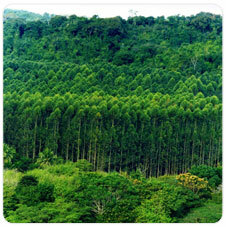 CERFLOR is internationally recognized by the PEFC Council (Programme for the Endorsement of Forest Certification). FSC®, for its turn, is an independent international organization whose members are representatives from social, economic and environmental sectors. It establishes sustainable forest stewardship principles and criteria. The Chain of Custody certification is deemed a plus in the market, as it attests to the consumer that a given forest-related product (wood, non-wood or pulp) uses raw materials from 100% Certified Forest (FSC® Pure) or Controlled Source and Certified Forest (mixed Source), in compliance with FSC®’s and CERFLOR’s principles and criteria. From the society’s standpoint, a Company that holds such certificates means that it is open to dialogue and adopts transparent practices. From CENIBRA’s standpoint, this is one more positive outcome of its permanent search for continuous improvement and excellence in forest stewardship activities, which adds extra value to its products. CENIBRA’s Forest Stewardship Plan (available at the Company’s website) sets forth the corporate actions intended to ensure the current and future production capacity of its planted eucalyptus forests. The production process follows strict social, economic, technical and environmental planning in every stage, from seedling production, tillage and planting to forest maintenance, harvesting, wood transportation to the plant, and monitoring and conservation of native woods. 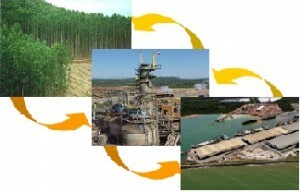 CENIBRA’s Chain of Custody enables the entire production process to be traced, from wood receiving to sales to customers. All the process stages are described in detail in the Chain of Custody Manuals. These Manuals are available for consultation in the Integrated Management System. Traceability covers all the steps from the forest to the customer or the other way around, i.e. from the customer back to the forest. Certification has to do not only with product quality, but also with production process quality. By maintaining such certifications CENIBRA reaffirms its commitment to the region’s development through the adoption of an ethical, respectful approach toward the communities, customers, shareholders, suppliers, employees and the environment as well. CENIBRA was the first Brazilian company to be simultaneously granted the FSC® and CERFLOR certificates for both Forest Stewardship and Chain of Custody. These are accomplishments that attest the excellence of the Chain of Custody and Forest Stewardship practices of one of the world’s biggest bleached short-fiber eucalyptus pulp producers.